At our house, particularly through the green months, Taylor's encyclopedia is planted reliably on the kitchen table. Rarely a meal goes by without someone opening it to check on a propagation technique, a native garden listing, or the proper Latin name for a familiar plant. We splurge on Frances Tenenbaum's well-chosen facts and gorgeous photographs, then we go out into the garden inspired to dig and delve. Our goal is to transform our little yard into a space primarily for native plant species, and this book has guided our progress, though it offers information well beyond the scope of our project. 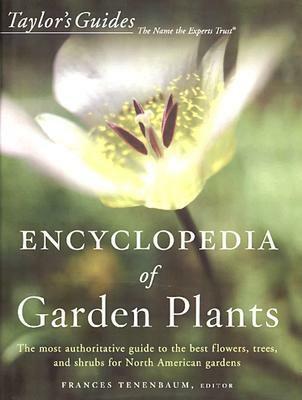 If you plan to purchase just one garden reference book, or if you are looking for a gift for someone who is fairly seriously into gardening, this comprehensive encyclopedia will serve you well. Don't make the mistake of placing it on the coffee table--this hard-working tome belongs at the center of the gardener's home. My new favorite coffee table book. So practical and loaded with great photographs and advice. Nothing ridiculous like plants that only grow on Mt Everest. Weighs a ton! The most comprehensive guide to all levels of gardeners.